This book will show you how to break through that self-imposed ceiling. It will challenge you to take command of your life by awakening you to your hidden beliefs and stories that hold you back, disrupting your self-destructive patterns and behaviors, and designing a future you can’t wait to live into. $0.99 on Kindle. 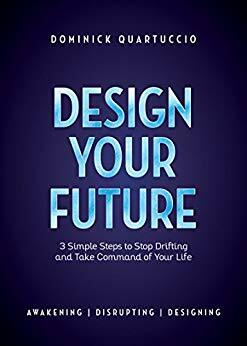 Find more books like "Design Your Future: 3 Simple Steps to Stop Drifting and Take Command of Your Life" by Dominick Quartuccio on kobovskindlereviews.com. We feature both reviews of ereaders and discounted + free books on Kindle. Browse more books in the Advice & How To. Disclaimer: "Design Your Future: 3 Simple Steps to Stop Drifting and Take Command of Your Life" price was accurate on April 15th, 2019. However, Amazon Kindle book prices can and do change frequently and without notice. Before you buy a book on Kindle, it's best to double check the price. If you purchased a Kindle book that you thought was free, you can return it by following the Kindle book return instructions here.